The Old Foodie: Dinner for the Workers. The five hundred workmen who had completed the renovated the exterior of Buckingham Palace in only 13 weeks were entertained at dinner by King George V on this day in 1913, at a Holborn restaurant. A large number of the public who “recognized that the dinner was a well-deserved tribute to the craft and discipline of British workmanship”, came along to watch the men arriving, and a large number of souvenir sellers had a nicely profitable evening. A letter of thanks from the King was read out by the Master of the Household. “I congratulate you upon an achievement both in handicraft and rapidity of execution. You have raised what is acknowledged to be a distinct architectural improvement in London, and a worthy addition to the Empire’s memorial to Queen Victoria”. The “comrade who lost his life in the execution of his duties” was given an honourable mention, and the men were finally able to tuck into what was probably for many of them the most spectacular meal they had ever had in their lives, accompanied by “an abundant supply of good ale”. 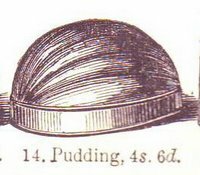 Saxon pudding may or may not have been chosen as a nod to the King’s German heritage, but it would certainly have been popular with his dinner guests on the day, who would all have loved steamed puddings. This one is a lighter and more elegant version than the solid suet pudding which would have been more familiar to the British Victorian working man. According to high authority this is one of the best puddings of Germany. Boil a gill of milk, put into a stewpan half a pound of flour. Gradually dilute the flour with the milk, so as to obtain a fine smooth paste. Add four ounces of butter, and salt to taste. Place the saucepan on a moderate fire, stir the preparation till it begins to thicken, then take it off the fire, but still continue working it. When the paste is smooth, place it again on the fire, working it still, and gradually introduce into it the yolks of ten eggs, four ounces of oranged sugar, four ounces of butter, and a little salt. When the preparation is frothy, introduce seven or eight whipped whites of eggs. Pour the preparation into a dome or cylinder mould which has been buttered and glazed with sugar and potato-flour. Set the mould in stewpan with boiling water reaching to half its height. Bake in a slack oven for forty minutes. That was the best ice-cream soda I ever tasted. Reported last words of Lou Costello, died March 3rd 1959. A Fish dinner on the Beach. A Pink Tea for Breast Cancer Month. In the name of Coleslaw. Recommended to the German Housewife. Big Fish of the Sea. The Coronation of Henry IV. On gods, mice, and leaves. "A Solace of Ripe Plums"